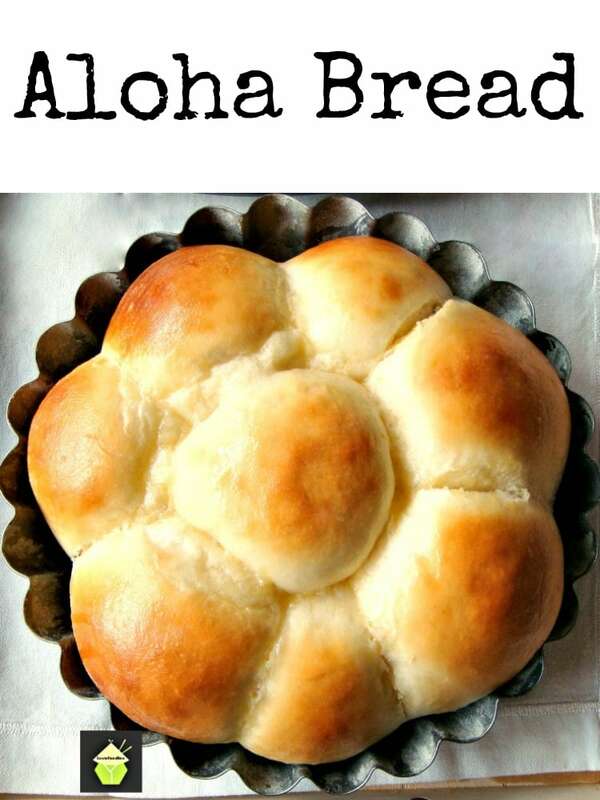 ALOHA BREAD! 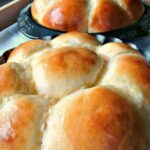 I made the recipe super easy for you, the rolls are sweet, soft, and oh yes….. they even say Aloha when you bite into them! 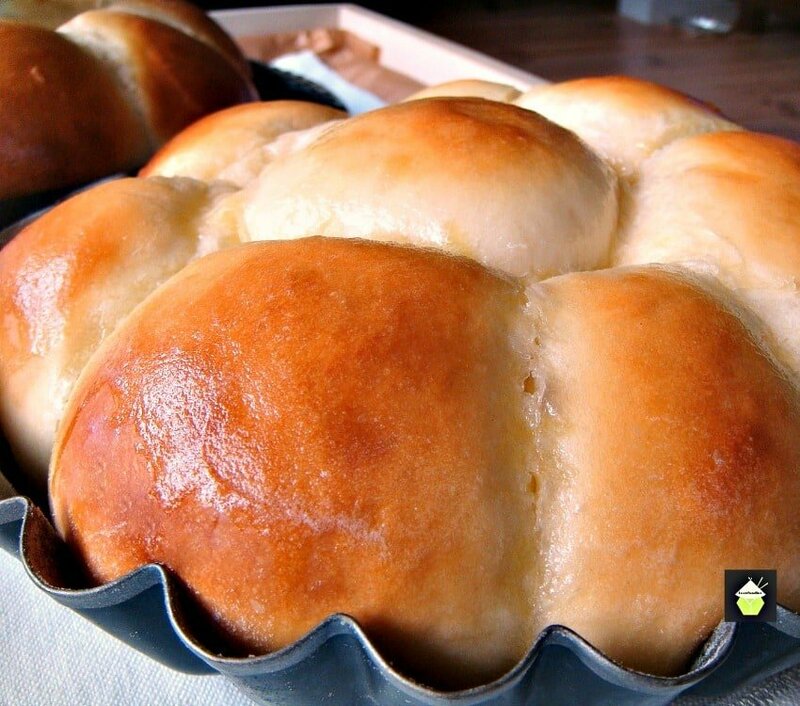 ALOHA BREAD, delicious sweet, soft rolls! These rolls are amazing and the recipe is incredibly easy. just follow the steps and you can’t go wrong! Aloha! Why have I called this recipe Aloha Bread? Can you guess what is in the ingredients? This is a delicious bundle of soft, light, sweet rolls with a pineapple flavour and oh boy! It is delicious! This is an easy recipe, you can use a stand mixer or make by hand, and below at the end, I will add a very nice video for you if you wish to make by hand so you have the correct kneading technique so as to not spoil your wonderful bread. 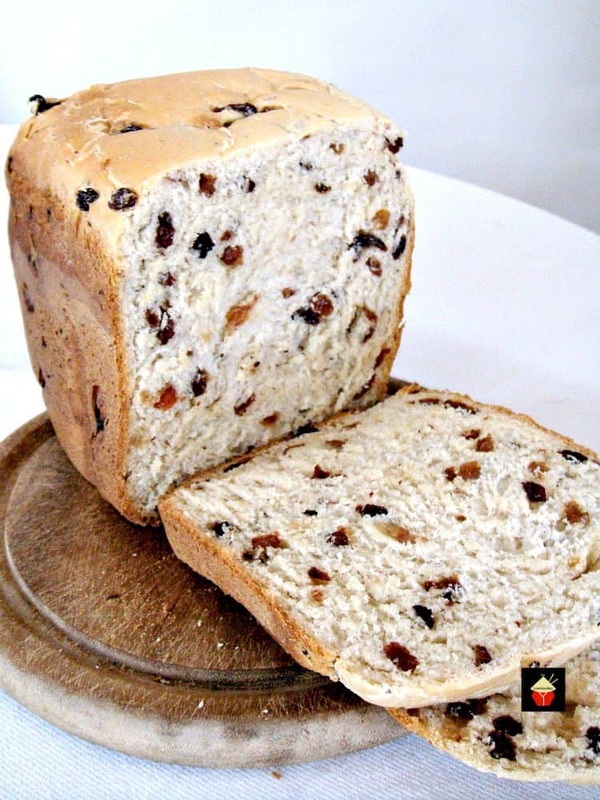 Try our lovely Aloha Bread recipe, it really is super soft, moist and yes, very very addictive! If you enjoy sweet rolls, why not try our really popular Blueberry Cream Cheese Swirly Bread Rolls. Oh boy! Be sure to make plenty of these too because they never last long! You need : 2 x 9 inch cake pans and parchment paper. 1. In small bowl dissolve yeast in 1/4 cup warm water, not so hot you can’t touch it, just tepid warm, cover and leave for about 10 minutes. 2. In a stand mixer, beat the yeast mixture,eggs, pineapple juice, 1/4 cup water, sugar, vanilla, and melted butter. When all combined, gradually stir in salt & flour until a stiff batter like dough is formed. *** If your dough is too wet, don’t be afraid to add more flour, a tablespoon at a time until it is dry enough to handle. It should come away from the mixing bowl in a ‘ball’ after kneading. Knead for 10 minutes using the dough hook, or by hand if you don’t have a stand mixer. (again, use more flour if kneading by hand so it is not too sticky wet to handle) Watch the short video at the end of this recipe for kneading by hand. 3. Cover with a clean cloth and place somewhere warm to let rise for 1 hour. 4. Punch the air out of the dough and turn it onto a well floured surface. Use 2 x 9 inch baking pans, and grease and flour the pans. 6. 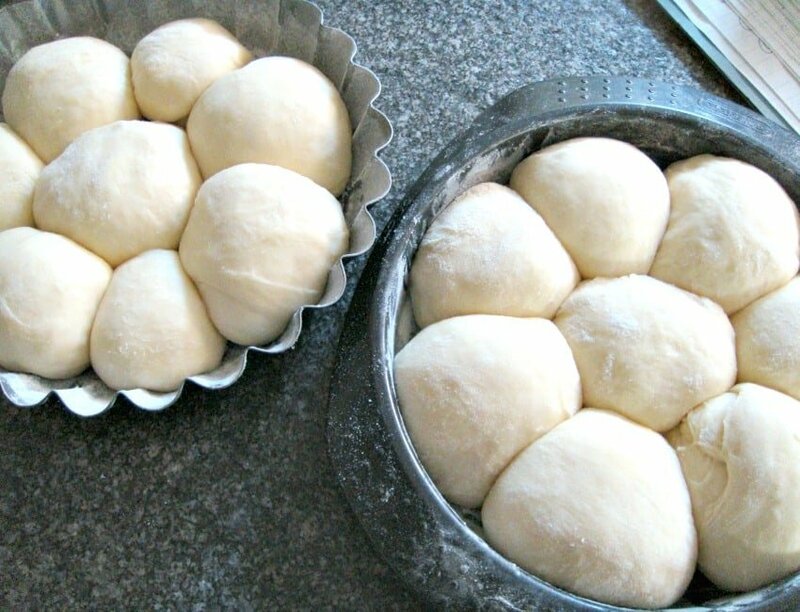 After dividing the dough, form into buns like in the photo below, so the seam side is placed down in the pan. 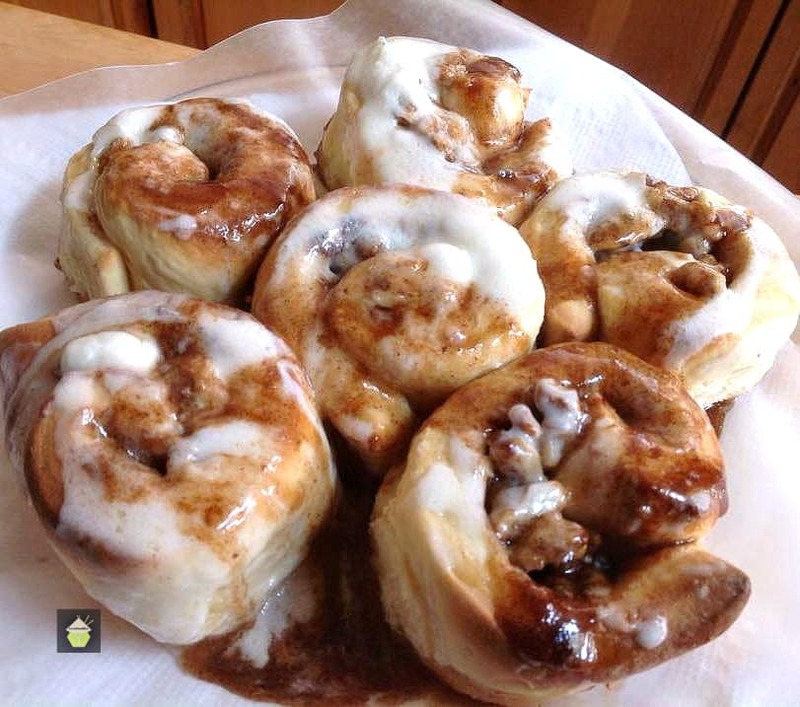 Arrange the buns like the photo, all around and one in the middle. Cover and let rise again until doubled and they are touching each other, about 40 minutes. If you’d like to use a fancy shaped pan for your rolls, we can recommend these ones. There are a variety of sizes, and you can use them for cakes, bread rolls, pies, quiche, the possibilities are endless! 8. Bake for 15- 20 minutes, then remove from the oven and brush the tops with melted butter. To test if the rolls are cooked through, Tip them out the pan (use a cloth!) and tap the base. Especially in the center. If it sounds hollow, they’re done. If not, return to the oven for another 5 – 10 minutes. Every oven is different but now you know the trick to see if they’re done! We’d love to hear from you and what you thought of our Aloha Bread recipe. Did you make any changes or add some other goodies? Let us know in the comments below. Thanks for reading and happy cooking! Why not try our Maple Pecan Rolls. These are very popular and perfect for a snack with a lovely cup of tea! 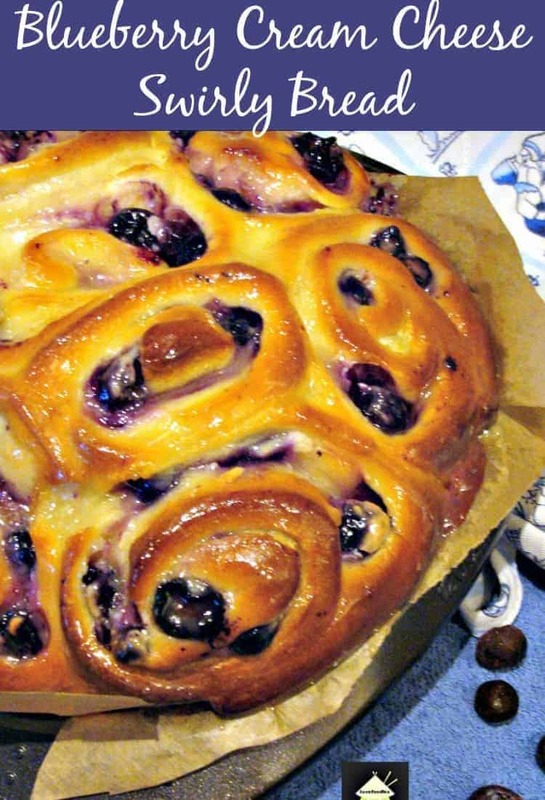 Blueberry Cream Cheese Swirly Bread… these are so good! Watch this handy video if you want to make this bread by hand. It’s short and has great advice! In small bowl dissolve yeast in 1/4 cup warm water, not so hot you can't touch it, just tepid warm, cover and leave for about 10 minutes. In a stand mixer, beat the yeast mixture,eggs, pineapple juice, 1/4 cup water, sugar, vanilla, and melted butter. When all combined, gradually stir in salt & flour until a stiff batter like dough is formed. *** If your dough is too wet, don't be afraid to add more flour, a tablespoon at a time until it is dry enough to handle. It should come away from the mixing bowl in a 'ball' after kneading. Knead for 10 minutes using the dough hook, or by hand if you don't have a stand mixer. (again, use more flour if kneading by hand so it is not too sticky wet to handle) Watch the short video at the end of this recipe for kneading by hand. Cover with a clean cloth and place somewhere warm to let rise for 1 hour. Punch the air out of the dough and turn it onto a well floured surface. Divide into 2 equal pieces and then divide each of those two pieces into 8, so in total you get 16 pieces. Use 2 x 9 inch baking pans, and grease and flour the pans. 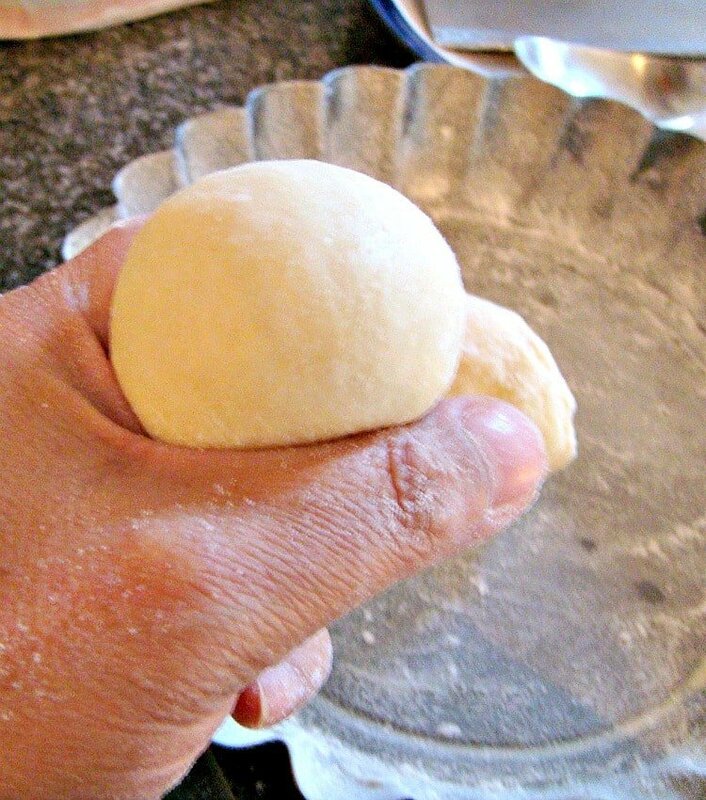 After dividing the dough, form into buns like in the photo below, so the seam side is placed down in the pan. Bake for 15- 20 minutes, then remove from the oven and brush the tops with melted butter. To test if the rolls are cooked through, Tip them out the pan (use a cloth!) and tap the base. Especially in the centre. If it sounds hollow, they're done. If not, return to the oven for another 5 - 10 minutes. Every oven is different but now you know the trick to see if they're done! I want to know if I can use Almond flour in place of all purpose flour and if so, is it the same amount or not? I am trying to get away from wheat or regular flour. Hi Amelia, I’ve never tried with almond flour so unfortunately I can’t say if it will give you the same results. It’s always tricky with bread so I wouldn’t like to guess and get it wrong! This aloha bread is just short of fantastic. Made it for a party and everyone wanted the recipe. I just have to try the recipe, I have always wanted to learn to make rolls and it kind of sounds like I have stepped in to a gold mine! If they are half as good as they look, they might be called aloha but with me there going bye bye!!! You’ll be absolutely fine Jeff! Just follow the step by step instructions and have fun! Do you have to add pineapple juice. Even though it’s in the recipe. Hi Clayton, the pineapple juice adds some sweetness to the bread. It doesn’t taste of pineapple once it’s baked. If you don’t want to use pineapple juice, you could add orange or apple juice if that helps! You must use something for the liquid if you don’t want to use the pineapple juice you must substitute it for another flavored juice. I suppose you could do just water but then they won’t be Aloha, Just a regular roll with no flavor. Hope that helps you out. Evelyn. I think I did something wrong, they weren’t fluffy in the end. Did I over knead the dough? Just finished a batch. Had fast rising yeast and used pineapple juice out of a can of pineapple. Results were a light and fluffy roll, but it didn’t taste of pineapple or the store brought Hawaiian roll. They were delicious all the same! Made the Blueberry Swirly Bread to sell at local farmer’s market and they flew off the table. These are sooooooo good! Hi I have 2 questions—can instant yeast be used instead of active and the water used with the pineapple juice can it be substituted for milk for richness—any suggestions? Oh, my, goodness! I made these last night and they are exactly like the store-bought brand…exactly. These are so good to eat. Congratulations for a copycat recipe this good. This bread is a big winner in our house. With friends making orders. I wouldnt change a thing. One time I was taken on a Big learning adventure where I was taught to use the exact yeast dry active. Do not change that step at all. Also do not use a muffin pan. Im baking this one for the 5th time tonight. I always make extra batches. 1 batch is never enough so delicious. Hi. Would I be able to freeze one of the pans of dough? Hello! Love this bread. I found some pineapple extract on Amazon to sub for the vanilla. I’m going to try adding a little crushed pineapple in the next batch of buns. I will have to adjust the flour of course. Great with teriyaki burgers, and ham sandwiches too! This looks amazing, I can’t wait to try it. How do you think extra virgin coconut oil would go in it in place of melted butter? I use coconut oil in bread often and it gives just a hint of coconut flavor. I love this recipe, tastes like kings hawaiian . no se podrá hacer esta receta en la maquina de pan, como un pan dulce ???? You can not make this recipe in the bread machine, like a sweet bread ???? I love bread and this recipe is awesome. I only eat bread on special occasions, and limit my intake of sweets and fluids. Awesome recipe. Made with Kahlua Pork and mac salad. So good that I had to make them again for Easter! Would like instructions to make in a bread machine! when you say pineapple juice, do u mean sweetened or unsweetened. 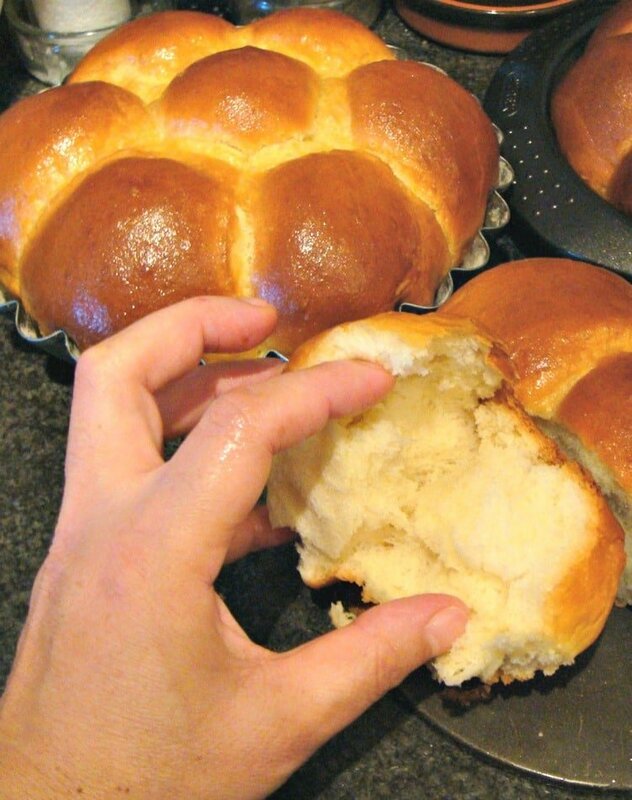 your rolls look so delicious and i cant wait to try them…. Hi Cathy, you can choose which juice you prefer. I use the natural juice from the can of pineapples, so that would be unsweetened. The rolls are very soft and tasty so please do enjoy! Hi Krista, yes, the ingredients are correct. The WARM water is used with the yeast. It must be warm (Not HOT!!) so that it activates the yeast which then cause the foaming action which ultimately gives the rise to the bread. The other water can be just plain tap water, which you add with the pineapple juice. If it is your first time making bread, just make sure you take note in Step 2 to knead the dough (use a mixer if you have) for 10 minutes. 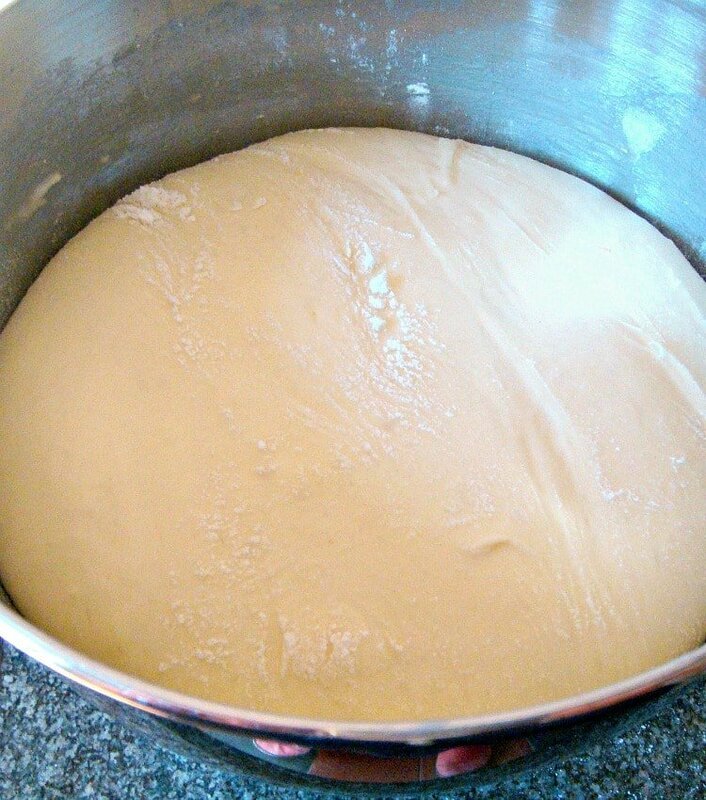 If, after 10 minutes, the dough is not pulling away from the sides of the bowl, it is a little wet, so don’t be afraid to add a little more flour whilst the mixer is on, add a tablespoon at a time, until you do see the dough pull away from the sides. Then you know it is of the right consistency. The problem with flour is that it varies from batch to batch, as well as brands, and they all absorb liquid in different amounts. That is why I added the note about adding more flour if needed. That’s really the only tricky bit in the recipe, but if you know about it then you should be able to do it just perfect! I hope this helps and enjoy the rolls. They really are yummy! This recipe looks amazing! I do have a question. Can you use margarine instead of butter? Hi Mackenzie, I’m only used butter for this recipe so I’m not able to say how using margarine will turn out. If you do use it, please do pop back and let us know how it was so we can help anyone else too! I made it with margarine and it was delicious! Wow! These were awesome! I was very pleased with the results & will surely be making them again! Had them as rolls with dinner & made ham & melted swiss sandwiches the next day! Just really very tickled with how they turned out! Thanks for sharing this recipe! Hi Amber, so glad you enjoyed the rolls. I absolutely love them with ham… it just seems to be one of those combinations that taste so good! Thanks very much for writing in and letting us know and wishing you a wonderful 2016! Have been making these dinner rolls for quite some time and love them. Decided to try the recipe in my bread machine set on 1 1/2 loaf and it turned out great and made a 7″ loaf of bread. Went over really great at our church fellowship Thanksgiving meal. Thanks very much June! So happy you were able to let us all know how the bread turned out in your bread machine. Have a really lovely Thanksgiving! Do you know how many days they will last after you make them? Hi Shellie, I have noticed after 2 days, they are not as fresh and soft. I placed them in ziplock bags, one at room temperature and one in the fridge to do a test, the fridge ones were softer after I warmed them through for a few seconds in the microwave, but to be honest, the best quality is on the day of baking these. If you wanted to make ahead for Thanksgiving, we have had reports of some who kneaded and shaped the rolls and then refrigerated BEFORE baking. They just brought the rolls back to room temperature then baked as per the recipe, and they all said the rolls came out lovely, so that would be an option for you. I believe some had kept the dough in the fridge for 2 days before baking. Hi Peri, I am so glad we got the thumbs up from your son! They really are quite addictive. I know for me, once I start eating them I can’t stop!! You are right about the flour, it is very hard to be exact, so your advice is absolutely perfect. Thank you! I don’t have a stand mixer… is there another way around that? Hi Nikki, if you pop down to the end of the recipe, there is a little video which shows you how to knead the dough by hand, so you can still make the bread. I made this recipe but there was a problem after the first rise. The dough rose but when I started on step 4, punch down the dough, it was all sticky and gooey. What did I do wrong? Hi Laura, I’m sorry to hear about the dough being too wet. It sounds like you perhaps needed to add some more flour, (when you punch it down on the work surface, don’t be afraid to add lots of flour on the work surface). The only other reason I can think of is if the dough was not kneaded for long enough for it to dry a little, like in the photos, but I am assuming you followed the recipe as shown. It’s always a little tricky when working with dough, simply because flour can vary so much , even the same brand but a different batch!. Flour absorbs liquid in different amounts, so you do need to judge a little by ‘touch’, and add a little more flour if needed when you are making in to balls. I hope you will try the recipe again, and please, don’t be afraid to add more flour if needed. Is there any possible substitutes for pineapple juice? I haven’t tried swapping the pineapple juice, but I don’t see any reason why you couldn’t try it using orange juice. Obviously it won’t taste the same but I say give it a go! Can you freeze these rolls? Would it be best to freeze them before they are baked or after? I haven’t personally frozen then prior to baking, only after baking and they were still very good once defrosted. So what I would be inclined to try is if you wanted to put the dough in the freezer after the first rise, then bring to room temperature, shape the rolls and allow to rise for the second time then bake. Or simply do it all in one go and freeze the baked ones. Please do let me know what you decide! and please enjoy. They really are delicious rolls! Thank you!! How long do they last in the freezer? To be honest, I really am not sure. I have made a double batch before and had them about 1 month in the freezer, just taking a couple out when I wanted for sammies etc, and they never last long since they get eaten so quickly!! But I think if you seal them in a ziplock bag, and get the air out, maybe a month or two? Question: could I just put this in my bread machine! I have to say I have never tried this recipe using a bread machine, so I can’t be 100% absolute sure! 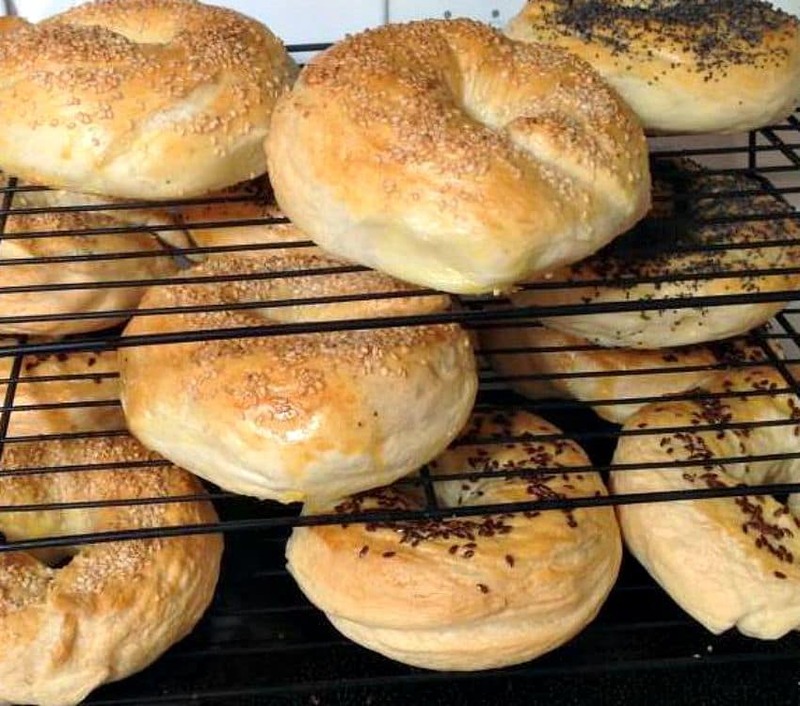 If you do try it, please be aware the quantities n the recipe as it does make quite a lot of rolls and i imagine, will be a little more than what a regular bread machine will hold. Please do let us know if you try it so I can pop some information for others who may also wish to try with the machine! Could use the pineapple juice and add some crushed pineapple? I have tried this recipe also adding crushed pineapple and the texture was not very nice. I found the bread to be very heavy, and not light and fluffy like when I make it using only the juice, so I would not recommend the crushed pineapple. Thank you so much!! Hope you have a wonderful Christmas! Thank you Paola, and wishing you and your family a very lovely Christmas too! Looks extremely moist, I’d love to try it! I love this bread. The secret ingredient make this bread extra special. Mary, these look absolutely fantastic!!!! pinning!!! Thank you Angela! So kind! I’ve heard so much how about Hawaiian sweet rolls. I cannot wait to give these a try. They look beautiful and better than store-bought. Will pin. Happy Holidays. Thank you! and wishing you a lovely Christmas too! Hello hi!I was looking for ur aloha,it’s so adorable. Thanks for the recipe. I gonna make it very soon. Hi Janee, I’m glad you found the recipe! Please enjoy and happy baking! Thanks Shauna! I’m so happy you like it! 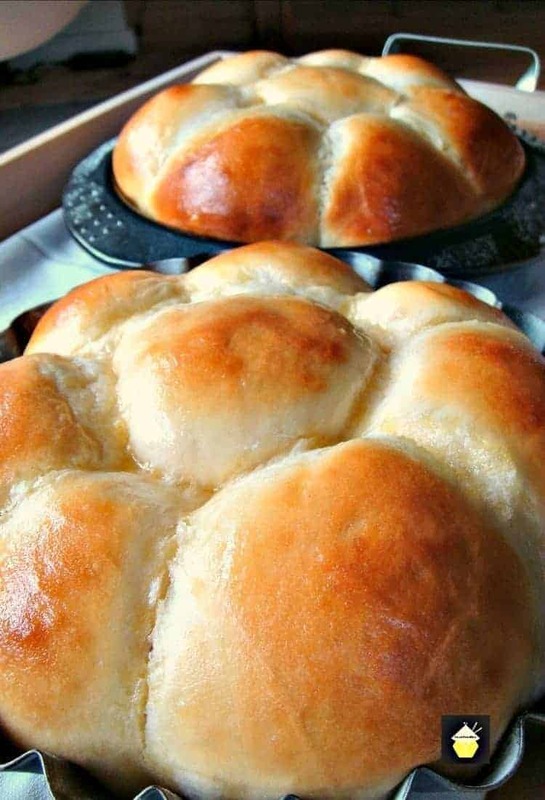 Homemade bread is a guilty pleasure of mine – I can’t wait to try this one! I’m glad you like it Jamie! Thank you! This sounds so good! And the pictures solidify that! Oh wow! I am adding this to my Thanksgiving day menu! Thank you Jen, please enjoy! This sounds really delicious – I love sweet breads! Thanks very much, I’m sure you will like this one if you like sweet breads! Happy baking! Oh man, this looks so good!! I have never had pineapple bread, but I think I may have to now! Looks delicious! I’ve never made a bread with pineapple juice before!! This looks amazing! I’ve never thought about putting pineapple juice in bread before. Thanks Stephanie, It is very delicious, so please do try it soon! I’m thinking of all of the wonderful sandwiches you could make with this bread- like pulled pork! Oh yes! I often make sandwiches using ham cold cuts, very yummy! I love all things bread and this looks delicious! Thank you very much Emily! Thank you for the video! Very helpful! You’re very welcome Melanie, I am glad you found it helpful! I bet the house will smell so good while these are baking! Can’t wait to try them. oh yes, Cathy, the smells were wonderful! Please enjoy! ooh this looks so good! Love the idea of pineapple juice in it! G;ad you like it Aimee! Please enjoy! This is one of my favorite breads!! I have never tried to make it! YUM!!! So glad you like it Evelyn, hopefully you will give it a go yourself! Happy baking! Thanks Emily, oh gosh, you must try it home made. I am sure you will enjoy it! This sounds great, bread is my downfall, especially when it looks this fluffy! Hi Rebecca, I’m glad you like it, the rolls really are very soft and fluffy, so I hope you get to try them soon! I haven’t had any feedback as yet re the coconut flour, but I did just do some research and found this informative link, which tends to make me want to steer you away from using that type of flour, simply because I don’t think, based on the information, you will be able to achieve a light fluffy bread from using it, which the Aloha Bread is. I think if you wanted to experiment a little, perhaps halve the recipe and try that way, so make half a batch, then you know. At least now you are making the rolls as per the recipe, you will know how they should turn out, should you wish to try another time with the coconut flour. Here’s the information I read if you’d like to take a look, and see what you think? Well…they were delicious! They were more dense than I thought they were going to be but this wasn’t a bad thing. Very filling. Gosh they look real beauties Mychelle! Yes, they are filling, I always find I want to eat more than my tummy can hold, but that’s just me being greedy!! If you want to make them a little less dense, you could add an extra 1/2 tsp of yeast and let prove for a bit longer (2nd prove) and see if that gives you more of a ‘fluff’!! On a side note, I’ve opened up a discussion in our Facebook Group about the coconut flour so I will see if anyone has any tips and let you know if there is any new information for you! This reminds me of these super soft rolls I often get in Chinatown although those have a coconut filling. I may try to replicate those using this as a guide. Great recipe! They’re certainly soft enough like the Chinese rolls! I’m allergic to pineapple, can I use a different type of juice, maybe orange juice, as a substitute? Hi Jen, I’ve never tried this recipe using orange juice but it was already on my list to try next time using mandarin juice! So I would say give it a go. Obviously he flavour will be different but you will still get all the texture and softness etc. I would also say apple juice might be quite tasty too! Do let me know how it tastes if you should try with the orange as I’m very curious! can the dough be made and frozen or refrigerated before use say a day or two/three in advance? Hi Eileen, I haven’t tried that myself so I can’t say if it would work. I guess if you refrigerated then brought it back up to room temp to rise properly it could work? Let us know if you try it and I can add your suggestion to the recipe for others! Happy baking! I made this dough on Saturday, November 23rd and let it fully rise. Then I put them in the refrigerator, with a lid on, and brought the dough back out on Monday, November 25th and let them come to room temperature. Then I formed the dough into 18 rolls and let them rise again and baked them. Perfect!!!! That’s very helpful Juenessa. I was hoping someone had tried it! Thank you for letting us know. Always handy when you can part prepare bread recipes! Thanks once again 🙂 and Happy Thanksgiving to you and your family! I just made these rolls and they are the best rolls ever! They are absolutely beautiful too! Thank you sooooooo much for a perfect recipe! Hi Juenessa! Thanks so much for your feedback. I’m very happy you enjoyed them. They are one of my favourites for sure. Happy Baking!